Who isn’t familiar with the black obelisk of Shalmaneser III? It was discovered by the late Austen Henry Layard, an archaeologist in 1845 during his excavations of the site of Kalhu, the ancient capital of Assyria. An obelisk is ‘a tapering stone pillar, typically having a square or rectangular cross section, set up as a monument or landmark’. Shalmaneser III was king of Assyria, who lived during 859 to 824 BC. The black obelisk of Shalmaneser III made of black limestone contains inscriptions and numerous scenes in bas-relief. The scenes speak volume about the deeds of King Shalmaneser III. This obelisk is currently on display in London at the British Museum. Several other museums have cast replicas of this obelisk. As per the British Museum excerpt on black obelisk of Shalmaneser III, ‘The archaeologist Henry Layard discovered this black limestone obelisk in 1846 during his excavations of the site of Kalhu, the ancient Assyrian capital. It was erected as a public monument in 825 BC at a time of civil war. The relief sculptures glorify the achievements of King Shalmaneser III (reigned 858-824 BC) and his chief minister. It lists their military campaigns of thirty-one years and the tribute they exacted from their neighbours: including camels, monkeys, an elephant and a rhinoceros. Assyrian kings often collected exotic animals and plants as an expression of their power. The black obelisk of Shalmaneser III It is the most complete Assyrian obelisk yet discovered, displaying the earliest ancient depiction of Jehu, King of Israel. Reference of the inscriptions of the monument to ‘Parsua’ is also the first known reference to the Persians. 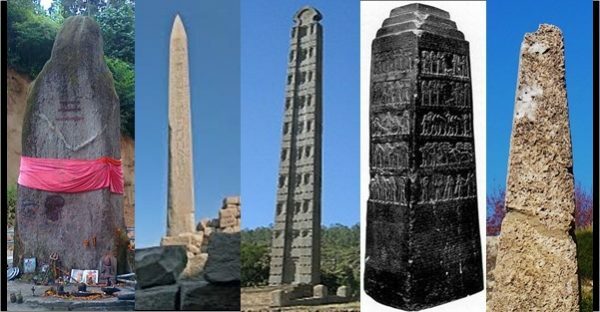 Do you know the secret of OBELISKS all over the world started with the Obelisk built by Abraham or his descendants? Who is Abraham? The people of Israel (also called the “Jewish People”) trace their origin to Abraham, who established the belief that there is only one God, the creator of the universe. Abraham, his son Yitshak (Isaac), and grandson Jacob (Israel), are referred to as the patriarchs of the Israelites. His edicts match with Hindu tenets of “Ekam Sat Vipra Bahudha Vadanti”. There has been clinching evidences that Abraham belonged to India. Yes, Abraham was from Mathura! This fact was surprisingly ignored by the mainstream historians. There is ample literary evidence that Jewish Abraham was from Mathura. In his times there were two rival sects vying for favours of the king – one the LINGAM worshippers and second SHAKTI worshippers. There were many wars between this two sects. He was leader of the group of people LINGAM worshippers, who were finally excommunicated from Mathura by the King of that time to avoid in rival squabbling. Subsequent wars between this two sects were solved by the exile of Abraham as per evidence in Anacalypsis by Godfery Higgins. There is inscriptional evidence pointing to the same statement of Aristotle (384-322 BCE) that links Jews with India. This statement is recalled in a fragment by Aristotle’s pupil Clearchus who traveled widely and whose inscription on a tomb of a friend is preserved in the Afghan city of Ai-Khanoum. Analyzing the religions and its methods of observances of rituals with code of the conduct we can safely assume that Abraham was what we would call nowadays a “Lingayat” (worshipper of Shiva Lingam). His was one of the outward journeying tribes from the Vedic fold. According to scholars, those who were defeated in the wars of Mahabharata and those who were affected by catastrophic earthquakes or a long drought that dried up the Sarasvati River around 1900 BCE, abandoned Harappan cities. There were great migrations away in all directions. This could have aided his connections to this land and migrations. The secret of OBELISKS all over the world started with the Obelisk built by Abraham or his descendants which being a Lingayat it is natural that he would build a Shiva lingam in honor of his Lord Shiva. It is believed he and his descendants worshipped Shiva. Obelisks are Shivlings – in reality Shiva’s Pillar Of Light. These are seen all over Egypt, Sumeria, Rome, Middle East, and across the world. As per a Jewish scholar, Abraham also founded a school named Bathsheba – which translates to House of Shiva!!! All obelisks were symbolic representation of Shivlings as all the ancestors of Jews were Lingayats [not the present Lingayats of Karnataka but lingam worshippers] from Banks of Ganges! The concept of Lingayat and Linga worship existed since time immemorial. And BASAVANNA codified it into method of worship. 1. Shivalinga (obelisk), Kardo Hills, Arunachal Pradesh, India. 3. Obelisk in Axum, Ethipia. 4. Obelisk of Shalmaneser III, Iraq. 5. J.W. McCrindle,j Ancient India As Described By Megasthenes And Arrian, Trübner & Co, London, 1877. 7. Anacalypsis of Godfery Higgins.